I'm going on this trip and will pay down payment now ($1,200) and balance later. I'm going on this trip and will pay in full now. Ski Portes du Soleil, the Largest Ski Area in the World! - Cross border skiing links 12 villages, two-thirds of them in France, the others in Switzerland. Famous names included: Les Gets, Chatel, Morzine, Avoriaz and the traditional Swiss resort of Champery. Morzine is a fine destination for skiers of all levels. 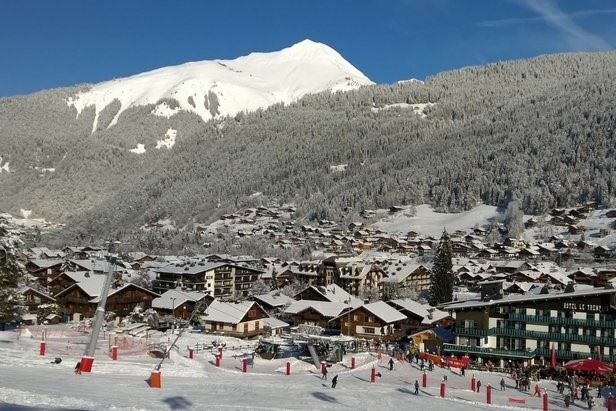 The Hotel Les Airelles is a four minute walk to the two lifts serving Portes du Soleil. Ski storage and equipment rental available at the hotel. After skiing, spend optional three nights in Lisbon, Portugal at the Hotel Mundial. Base Package Price - $2,400 (based on double occupancy) includes air from Grand Rapids to Geneva, round trip transfers from Geneva to Morzine, seven nights lodging at the 4-star Hotel Les Airelles, daily breakfast buffet and 4-course dinner. Optional extension to Lisbon, Portugal $385 includes three nights at the 4-star Hotel Mundial, daily breakfast and round trip transfer to and from the Hotel Mundial and the airport. Prices are tentative and subject to change due to changes in itinerary, currency, fuel surcharges, airport taxes or other fees. Package does not include: lift tickets, airline baggage fees, trip insurance, ski rentals, or lunch. Down payment of $1,200 due with registration and $1,200 due 9/1/18. Adjustments, Chicago Air Departure $200 and Lisbon Extension of $385 are due by check 10/1/18. Payment may be made with credit card (please pay for only one event/person per transaction).